I am extremely happy to welcome Dave Cousins to the blog today. He is the seventh author to join us from The Edge blog. 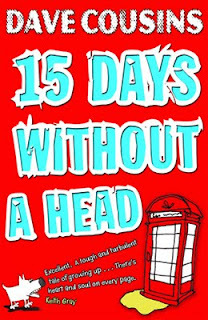 His debut novel 15 Days Without A Head is published in January 2012 with Oxford University Press. 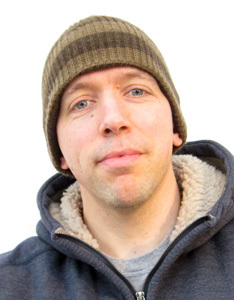 Dave was the winner of SCBWI's Undiscovered Voices competition for 2010. If you would like to know more about The Edge blog, then please click here. I’m delighted to be here, Viv, thanks for inviting me. After finishing art college I played in a band for about ten years. We released a couple of records, toured all over the UK, appeared on TV a few times and were almost famous! When I finally put my leather trousers into retirement, I got a job as a graphic designer. How long did it take you to write your debut novel ‘Fifteen Days Without A Head’ and where did you write it? I wrote a first draft quite a long time ago, but wasn’t happy with the result. I put it away and moved on to something else, but the story kept nagging away at me, so I decided to start again from scratch. That was the version that eventually became 15 Days Without a Head. I wrote it anywhere I could fit in some writing. I was still working full-time and had to find opportunities to write around that and my family. Most of the book was written at my desk in the attic, either early in the morning or late at night, when everyone else was in bed. I also wrote in my lunch breaks, sheltering under a canal bridge when it rained. During revisions I used to mark-up the previous night’s pages while walking to work – in the snow a couple of times! An incident I witnessed in a pub one afternoon. A really drunk woman arguing with the people at the next table, much to the embarrassment of her sons. It made me wonder what life was like for those two boys, what would happen when they got home. All my stories grow from a spark like that – a character or situation that affects me in some way and makes me care enough to start writing to find out what happens next. My attic is stacked with boxes and envelopes stuffed with finished and abandoned manuscripts. I should probably have a look and see if any of them are any good! I understand an extract of your book was published as part of the Undiscovered Voices anthology 2010, did that help you find an agent? Yes, my agent Sarah Manson was one of the judges! Undiscovered Voices had a huge impact on my writing career. I was bowled over by the interest I received from agents and editors when the anthology was published. UV is such a great idea and has been incredibly successful. So far, thirteen of the twenty-four winners have publishing contracts and have been nominated for (and won) an array of literary prizes. I did a couple of edits with Sarah, one of which involved re-writing the second half of the book because I wasn’t happy with it. All the time I was writing about Laurence and Jay, I knew I had a responsibility to do justice to their story and tell it properly, which made me very critical of what I wrote. Once the story was working, we did another draft concentrating on crafting the writing, which is a part I really enjoy. I like chopping sections away, tightening everything up, finding better ways to tell a particular scene. I love playing with words, the rhythm of the language – it’s an excuse to get my Thesauruses out and drool a little. A mixture of delight and amazement. Even though I’d had such a good response from the anthology, with lots of editors saying really nice things, I still didn’t believe it would actually happen. I don’t think it felt real until I received the bound proofs a few months ago and saw 15 Days Without a Head in book form for the first time. It feels like a lifetime – over eighteen months. But all the publishers I met were talking about a January 2012 publication. I’m gradually learning that the industry tends to work to very long lead times. Once I’d signed with Oxford, I did another draft with my editor, Jasmine Richards. I also spent some time checking my research. When I wrote the book I wasn’t expecting it to be published so I’d made up names for things – like the supermarket the boys visit and a film Laurence remembers Mum taking him to. I had to check they didn’t already exist, and make up new ones in a couple of cases. I delivered the book in December of last year, and since then it has been through the various departments at OUP – copy-edit, design, publicity, sales and marketing – on it’s path to publication in January. Ever since I found out that 15 Days was going to be published, my youngest has been talking about going into a bookshop and picking the book off the shelves. So I think we’ll go and buy ourselves a copy on the day it comes out, then maybe go to a café for tea and cake to celebrate! I’m currently writing my next book for OUP. It’s called Waiting for Gonzo, but I can’t tell you any more about it than that at the moment. Yes, and there still aren’t enough hours in the day! It’s not easy making a living as a writer, but it’s what I always wanted to do, so I feel very privileged to have the opportunity to give it a go. I get up at seven so I can have breakfast with my family, then make a cup of tea and head up into the attic. I try to be at my desk by eight o’clock. Before I start writing, I check my email and schedule for the day, to make sure there isn’t anything I need to do that I’ve forgotten about! I write until noon, then have a drink and something to eat. I’m back at my desk by one, to do another three hours, by which time my wife and son are normally home. On a good day I’ll write between four and five thousand words. I then do another couple of hours in the evening, though this tends to be all the other related bits of work, rather than actual writing. If I’m behind, or on a tight deadline, I’ll get up earlier and work longer. It’s a solitary occupation, but when I’m writing I hardly notice as my head is full of characters and the things that are happening to them. Though I do find myself talking to the cat more often than is probably healthy. Read a lot and write a lot! The importance of reading is often over-looked, especially by writers who have to make time to write, but as Stephen King once said, “if you don’t have time to read, you don’t have the time (or the tools) to write.” I would also advise finding a regular slot to write each day, even if it’s just for fifteen minutes, so you develop the habit. Keep writing and keep making mistakes, because that’s how you learn and get better. Each word you read makes you a better writer, each word you write, even more so. Lastly, don’t give up and don’t be too impatient – write because you love writing, not purely to be published. Thanks Dave, for a fabulous interview. Although I still didn't quite catch the name of the band you used to play with! Fifteen Days Without A Head will be available in January 2012 and I am completely positive you will love it. Great interview, I'm really looking forward to getting to read "15 Days". I love the way you got your idea for it. Excellent Big Break interview, Vivienne! The author offers terrific advice about writing--and reading! His work sounds quite good, too, even if he suffers a tad from writer's guilt (that's a joke!). Thanks again for inviting me to take part in The Big Break feature, Viv, and for your fantastic support for 15 Days Without a Head and all of my fellow authors at The Edge. As for the name of the band I was in … now that would be telling! I like his advice to aspiring writers. I do remember that King quote.